Bendheim is the proud decorative architectural glass partner to Patient Room 2020, a next-generation healthcare design prototype of a safer, more streamlined, restorative, and engaging environment for patients, families, and caregivers. Patient Room 2020 was developed by NXT Health, a nonprofit organization dedicated to collaborative design innovation for the improvement of the patient experience and the optimization of caregiver performance. The project draws on the resources of architects, designers, healthcare professionals, and building product manufacturers to solve some of the greatest functional and aesthetic challenges facing in-patient healthcare facilities. As one of NXT Health’s partners, Bendheim worked with David Ruthven, principal designer of Patient Room 2020, to find innovative glass solutions for the project’s Open Bathroom, a key component of the design. The adaptable bathroom features a sliding Houdini™ glass door system, which can be reconfigured to meet unique care needs. The design required a light transmitting material that would provide complete privacy. 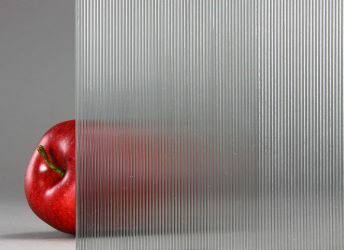 Bendheim’s Houdini™ Glass delivers both, thanks to its fine, micro-fluted obscuring texture. Laminated with a white interlayer to complement the contemporary palette of the room, Houdini adds brilliance to the space. Its refined linear pattern emphasizes the project’s streamlined aesthetic. The bathroom’s shower enclosure features Bendheim’s translucent teal colored safety tempered-and-laminated glass. Ruthven selected the color from a variety of custom hues developed specifically for the project. The back-lit, ultra-clear (low-iron) mirror above the sink cabinet is another custom creation. The mirrored glass doors feature a selective etching technique allowing for dynamic back-lighting. The cabinet shelves are safety-tempered low-iron glass, a material with an ultra-clear, brilliant quality.